Must have been the perfect pitch session. ‘Stand by Me with Aliens’. There, you have it. Sign the cheque, make the movie, form an orderly queue. And the best part of this story – it works. J. J. Abrams has made a perfect Spielberg movie, just when you may have given up on the man himself. A group of 12 year olds are making a Super 8 zombie movie. It’s 1979 and Super 8 is the perfect medium for young filmmakers. Riley Griffiths is the bossy director hoping to impress the leading lady Alice (the gawky but wonderful Elle Fanning) Joel Courtney is Joe, the make-up artist who also has a thing for Alice, and there’s Martin (Gabriel Basso) in charge of blowing stuff up. Add to the mix Joe’s mum was in a steel mill accident because Alice’s father was too wasted to go to work (she filled in for him and died) you have an explosive set of resentments with the parents. Joe’s father is a cop who takes his job seriously and doesn't want Joe seeing Alice - ever! Whilst secretly filming a detective scene at the station at midnight, a freight train approaches in the background. Naturally the director wants the train in shot. As the train approaches a truck drives onto the line. Only Joe notices and begins to realise a train wreck is about to happen. All hell breaks loose, the kids run for their lives and the camera keeps running…the train wreck is spectacular. Better yet, they know the identity of the driver of the truck that caused it. Mortally wounded he tells them to flee as the Army moves in. But why would he try to stop a train? More importantly, what happened to his body? 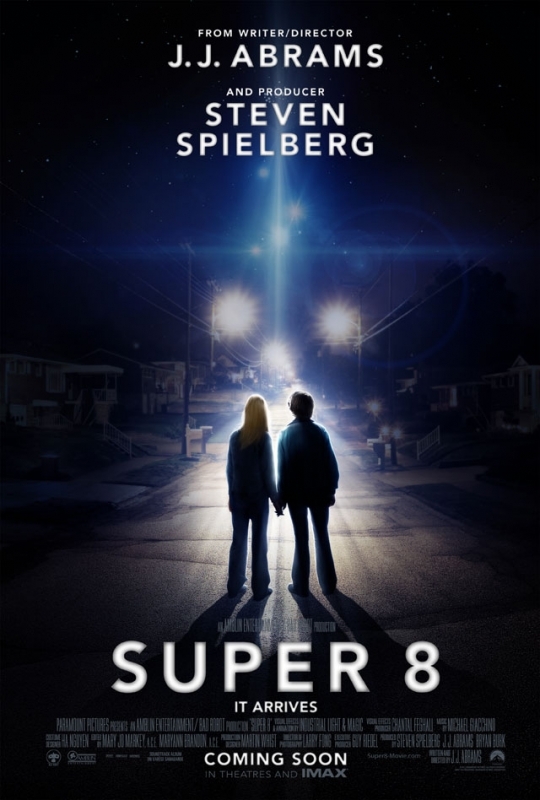 Super 8 is the perfect kids movie. The interplay between the characters is great. The terror they feel as the Army takes over their little town and locks everything down is real. The fact that the dogs all flee the town is a great idea (somewhat lost in the narrative later) but the kids know something strange is going on with that train and they had better continue filming. When they finally get the crash footage back – they are absolutely certain. And then people start disappearing... Why is the Army destroying their town, block by block? What aren't they telling people? Why does everyone have to be evacuated? The last quarter of the movie doesn’t quite keep up the thrills, but without doubt it is certainly the best kids movie out there for years and you’ll have fun living back in 1979 in a world without instant messaging and the internet.